While looking at the videos of anomalies on the Ünür.com site, I’d noticed an odd alternation of blue and red. Here we were used to seeing these consistently RED annual anomaly maps and this video showed alternating RED and BLUE. How can this be? That reminded me of the pattern I’d seen in the data files of “Winter Warms, Summer Doesn’t” and that it was more in some months than in others. A little bit of change and the dT/dt code, instead of making monthly anomaly ‘Hair” can make monthly Running Total Anomalies and show us the “Global Warming” for each individual month… And that’s what I did. Call it: dMT/dt. If we were having consistent “Global Warming” you would expect to see consistent rises to the monthly data. Perhaps with one season showing more warming than another, but mostly with things all ‘rising together’ to some degree. It also ought to have more onset early (as CO2 has log onset with diminishing returns) but with the potential for a mild exponential if there is, in fact, some sort of ‘tipping point’ feedback mechanism. What you would definitely NOT expect is for 2 similar months in the same season to be going in different directions, nor would you expect different months to have divergent effects where, for example, May warms but April and June cool with July dead flat. February falling, headed for an Ice age, while December rises with a wobble. April and May rising rapidly. July and September just lay there… Poor March, plummets then rockets. February having massive Global Warming, while March gets in on the act too, but only after dropping into 1845. And it looks to me like July will have none of it, yet August dashes back and forth around zero ending up going nowhere, though having had some cool fits along the way. Much less total change. (Notice the narrower scale). January, April and May just On Fire! (though after a bit of a sag…) while December crashes, only to be pulled up a bit in the end. August and November just wanting to be left alone. I’ll be doing more of these but not at nearly the pace I did for the global dT/dt set. I wanted that baseline done to assure what was seen was shown to be global and to identify “interesting places” for further study. But I’m not ready for another marathon graph session like that one any time soon… So these will come out 2 or 4 at a time. With some discussion as they happen. To me, these graphs just look very “unphysical”. You can have Jan rising while Feb falls. You can have global cooling in one month and global warming in another, while some months ‘just lay there’. I don’t know if it’s “splice artifacts” (though it isn’t always, I’ve seen these patterns in a single thermometer…) or if it’s a “QA Artifact” (that is an attractive option as some of the impact looks to be in one month but not in a neighbor in a way similar to the odd grouping of months by seasons in some of the climate codes… so if QA were done ‘per season’ the edge effects would follow). So, speculate away… Lord knows I’m at a loss to explain it. All I can do is say: “This is what the data said when I asked them politely – then shut up and listened.” And if anyone has ideas how to better visualize this data, feel free to give it a whirl. I’ll include a couple of the data reports for folks who want to play with it. I’ve added a couple of more. Antarctica and Mauritius. What happens to December bothered me, so I ‘ran the numbers by hand’. In the process I’ve decided I need to change how this code works (slightly). Generally just laying there around -1 C until a bit of a squeeze in the mid 1970s. Then flat but squeezed through the 1980’s and we hit 1990. Then all hell breaks loose. What The … happened to December? The range gets dramatically compressed and there is a general rise to the bundle (though May and January don’t want to play). The same processing that gives the “Bullseye” on the dT/dt graphs makes December jump more than is warranted. I deliberately did not “feather” together the “Duplicate Number” transitions in the dT/dt set as they make a better indicator of when something odd happens that way. But at the monthly detail level, you can get a rather too abrupt transition. (When the new “Duplicate Number” takes over, you get a dropped value, as that’s how the “First Difference Method” did things and dT/dt is modeled on it). In a yearly average that’s not too bad, but in a single month it can be a bit drastic as a month can have an extreme value from time to time. Dropping that extreme event can result in a “jump” like in this graph for December. I’m going to re-work the dMT/dt code and see if I can smooth out the “Duplicate Number” transition somewhat. Basically, feather together the “Duplicate Number” transitions via averaging the duplicates together in the overlap (rather than taking a ‘line of zeros’). Year, dT, dT/yr, Thermometer Count, 12 Monthly Anomaly Running Totals Jan – Dec. This entry was posted in dT/dt and tagged GHCN, Global Warming. Bookmark the permalink. It’s interesting that from about 1995 on the variability (ie, the excursions to the extremes) narrows considerably. That that seems to be a gradually increasing trend from the early 1800’s to 1995 and then, BAM, the amplitudes just drop right down suddenly. I don’t know what that may mean but it’s an interesting and obvious perturbation. The early narrowing is a simple and essential mathematical side effect of thermometer count. And, as you can see, it is symmetrical to the mean. As you average an ever larger number of things together, to get an “extreme excursion” requires an ever more unlikely event (all of them moving together). Where at “the start of time” almost universally it is one (or very few) thermometers, so “extreme excursions” only require one place to have something “odd” happen. What is astounding about the Emeril like “BAM!” is that it happens WHILE COUNTS DROP. We ought to be seeing a re-expansion of range as the counts drop, instead we get more compression? Very non-mathematical and non-physical… And that it’s all the ‘cold anomalies’ that get destroyed is also very odd. That’s not a statistical artifact of large numbers. It’s very non-symmetrical. And that’s part of why that “count” line is there. So you can see which way the “central limit theorem” and the “law of large numbers” ought to be pushing. I’m not sure I know what to make of these. In France, I’d hazard a guess that December could be affected by thermometer additions in cooler places. Bahamas it looks like one added then the other one dropped. Hmm worth a closer look. A suggestion reflecting an uncertainty I have. You are using anomaly data to extract those informative dMT/dt graphs. This asks, is the baseline period, be it 1951-1990 or 1951-1980, of constant or variable condition? Given the dropping of a large number of stations from some global compilations lately, what is the fate of a station in the reference set that is closed after (say) 1990? Is it also removed from the reference set? (a) If it is removed, then there will be a change in value of the reference temperature which is subtracted to give the anomaly (b) if it is not removed, then the present geographical spread of stations is not the same as in the reference set and so a source of error if too many hot or too many cold stations are left (“The march of the thermometers”). Would it be appropriate to suggest a subset like France be re-run on actual deg C values (not anomalies) to see if the essence of the graph is retained? The deltas should be equally valid, perhaps more valid. So the dT/dt method does not take a reset on data dropouts. It also simply compares one month of one thermometer to itself in another year (whenever the next valid data for that thermometer for that month comes along) and does not make an annual average of temperatures. Finally, the first form of dT/dt I wrote used ‘the past to the present’ as the time axis. This had the present subject to showing wild anomalies based on a ‘first datum’ being a randomly extreme event. So I ‘reversed time’ in the ‘create running totals’ step. So a thermometer ANOMALY is calculated month to month going forward in time for each thermometer, but the running total of a set is calculated going backward in time. This puts the ‘line of zeros’ that happens at the first year in a ‘long ago time’. One could ‘run time backwards’ in this step too, but I don’t think it will matter much. As it is, you end up with a set of annual anomalies that run all the way to “now” (or whenever the thermometer dies). Then I add these up going backward in time. This puts “NOW” as “normal” and shows how the past was ‘relative to now’. So, in some ways, you could think of “now” as the baseline (though it really isn’t a baseline, it’s just a starting point for accumulating change metrics). This is done for ALL thermometer records. Every Single One. So there is “no baseline” and “no baseline set”. Adding or dropping a thermometer will only change its own anomalies (though what value those anomalies contributes to any running total would also change). So, what happens when a thermometer is dropped? Say there were two thermometers. One running from 1981 to 1990 inclusive (10 values) and the other from 1980 to 2010. I’ll just give one set of numbers, but this would be done for every month of the year. So think of this as, oh, January temps. You can see that I’ve made the post 1990 anomalies for Therm2 simple as they are all a one or a 0.5 multiple. This is just to make the math obvious. You would continue this process all the way back to 1990. At that point, the anomalies for Thermometer 1 begin. Now you have a 1.0 for one thermometer and a -1.0 for the other. At this point, I average the two thermometers numbers and use THAT as the thing that is “accumulated”. So we would have “0” as the average of 1.0 and -1.0. The next value would be “(3.0 + 2.0) / 2” or 2.5. Then (-1 + -1) / 2 = -1. Then -2, then 0.95 then 0.6 etc. 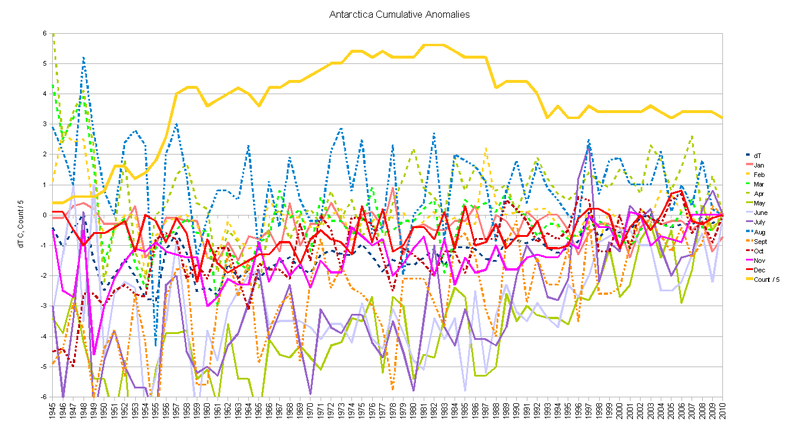 THOSE values are what would be used to continue the running total of anomalies ‘backward in time’. Basically we are averaging the two thermometers “changes” together to get the composite change to date (going backward in time). This has the many benefits. In theory, the “present time” has the best thermometers, so we start our series with where we are now with “the best we have now”. As we go back in time, adding thermometers increases the data precision (how accurately the world is sampled) as The Great Dying becomes The Great Birth of Thermometers. Then finally at the very beginning of time you get the “lone old thermometer” that might have had questionable calibration. So, in theory, all the worst measurements are accumulated into the running total at the furthest distance back in time. Basically, 1720 is more prone to error, but 1880 ought to be just fine. Basically, one of my “design goals” was robustness to station changes. Minimal impact from any individual station and no stations with a “key or special role”. Further, if you want to, you can MEASURE the impact of any station or set of stations. Simply run with the report with them both in, and out, of a set. While I’ve not used this “benchmarkable” feature yet, it was a design goal. This means that there is NO baseline sensitivity. NO key stations or time. Not even a need for “fill in” or “interpolation” to make data “complete enough” for various calculations. If you have no data, you get no anomaly (as that is all you really know), but if, after 5 years, you get a datum, you can find the “change over that time” and fill in the anomaly. The only ‘odd bit’ is that it shows up in one year. But that doesn’t really effect much. 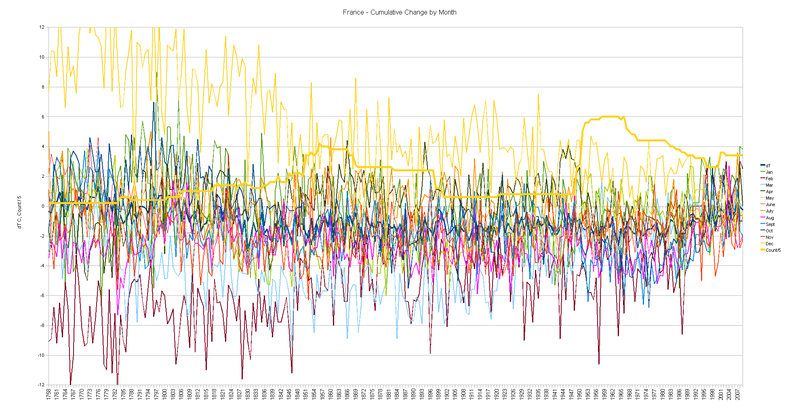 BTW, for France I did do a “rainbow graph” of actual temperatures under the “France, Hide The Decline” posting. They show very similar things. So yes, I do like to anchor myself back to real temperatures from time to time… In fact, this effect shows up very well in the temperature rainbow graph by month. The dMT/dt method is just an attempt at a better visualization of it. BTW, the dT/dt and the dMT/dt methods are not perfect. They are subject to ‘splice artifacts’ and if the end of a series has lots of data dropouts, you could have a dangling end where the bias was not ‘closed’ from leaving, oh, December out for 3 years if the thermometer dies before a December datum showed up. Say the two thermometers did NOT overlap much, one rose for 10 years of UHI then the next one picked up for another 20 years of UHI. If the first town had booked all the UHI it was going to get, the SERIES would have “double booked” UHI by splicing the two sets into one anomaly series. I’m “ok with that” as I’m not trying to calculate some fictional Global Average Temperature. I’m trying to measure what GIStemp (and related like CRUTem) do and find a better benchmark. So I want to see the splice artifacts so I know where to go digging. But they ARE pretty darned good methods. From about 1820 to date the graphs do a dandy job of reflecting known real events. Basically the “reality check” is that they do a pretty good job of matching recorded objective reality. OK, with all that said: One of my “someday” things is to run dT/dt (and now dMT/dt) on somewhere like France with “all thermometers” and with “survivors only” and see what is the difference in using “all data” vs just using “the present thermometers history”. It ought to enlighten in some way. (either showing ‘survivor bias’ in the present set or perhaps ‘splice artifacts’ in the all data set. We’ll see…) I also want to do it for each of the survivor thermometers as a singleton (so we can clearly see ANY splice artifacts in the set) and compare that to “temperature rainbow graphs” for each thermometer and for France as a whole. Gah! you hurt my eyes. How about a trend-line(s) only version? Mea culpa, I did a quick take without adequate catch-up reading earlier today and then after I posted I remembered earlier descriptions of your method. I had wrongly jumped to the conclusion that your starting set was the difference from a 1951-1990 base, my error. I cannot add to your description – the working backwards method has sense, the avoidance of infilling has a lot of sense and you are open about joining different thermometers. Your reality check of matching recorded data can hardly be criticised. For some days I’ve been trying to reconcile some of the comments in the UK House of Commons Inquiry and there is enough in there to befuddle any brain. In Australia, there was a change from thermometers to telemetry devices like thermostats, mostly around 1990-5. I’ve often wondered if that effect of that instrumental change shows up in country data, but I suspect the data I have might have been adjusted to remove step changes. Not sure, just looks a bit that way. Thank you for your patience in your long reply. I hope it helps others as well. Thanks, Geoff. Very interesting, especially Asian part of Russia. Interesting to see how autumn and spring temperatures jump around the time of the thermometer count drop (and the perestroyka). Thermometers moved to places with shorter snow covered period? In reply to earlier queries you have said that only about 200 thermometers carried over from the pre 1990 period to the post 1990 period within the GHCN dataset. Did the technology change at the 1990 pivot point either in the actual instrumentation used to record temperatures and in the ways used to record those temperatures? In the Bahamas, for example, there cannot be many, if any, opportunities to relocate to significantly lower altitudes or shift any great distance to be closer to the equator. So, for example, they still take the temperature at the SFO San Francisco Airport. But with different equipment and with a different process applied. Very few places that are still using the original equipment and process “survived” the “upgrades”. I looked at thermometers grouped by “length of record”. At that time I didn’t realize that the 1990 Pivot existed or was tied to a change of Duplicate Number ( or “modification history flag”). If you scroll to the bottom of the article, you find the 10% of ‘longest lived records’ with over 100 years history has very little “global warming”. But only 80 of them were active during the final decade… I didn’t realize exactly what it meant, but it was pretty clear that if stable long lived instruments were not warming up, it was the short lived changing ones that “were the issue”. Much of the work since has been to sort out more detailed views of “what, why, when, how…”. is also a decent entry point to some of that earlier work. E.M. Pleased to hear you’re thinking of an “own posting” for Australia. It’s a real goldmine IMHO ! Also good news Sinan Unur is warming up for another look at his work. I’m sure we all look forward to his updates. I’m continuing with a closer look at Tasmania and will hopefully have an interesting post coming up soon. As a titillation, have a look at the Australian BoM/CSIRO graphs of methane/CO2 covering the last century. It’s from their March joint “Climate Report”. The measuring station is at Cape Grim Lat.= -40.6828; Long = 144.69. Now check Smithton WMO 94952, a station with over 100 years records. Lat = -40.85 Long = 145.12, 37kms east of Cape Grim. Sinan Unur’s graph shows records from 1892 but according to BoM there must have been a site change to Grant Street, Smithton in 1911. It has made no difference. Unfortunately the station closed Nov.1 1997 and Smithton Aerodrome station 2.8 kms away was started in 1996. Wynyard WMO 94952, about 50kms east of Smithton and Burnie WMO 94958 a further 10-12kms east are worth a look to prevent any possible warmist cry of “cherrypicking”. I’ll have more to say on Burnie in a later post. In the understatement of the year I think you’ll agree that CO2/methane greenhouses gases in Tasmania certainly don’t appear to show any linear effect on temperatures ! (Apologies if this is OT, but it’s all getting inter-related) !!! Uh-Oh ! Something wrong with my links but you will find the stations on the unur.com site. I’ll try and find other links to the BoM graph. Guess I must have got too “cocky”! Another try at the links for the posts above. The CO2/methane graph is on page 5. I emailed them two weeks ago, so far with no reply. They describe the data content but not the format. Perhaps a reader here can shed more light on this and on how to get a copy. A CD of temperature records! Do you think they read them to us? Sounds almost as exciting as listening to the Stock Exchange Report or the BBC Weather Report for Shipping on the radio? The missing -sign at air ports with the introduction of METAR from 1989 could be an answer to your finding of the change in dT/dt around 1990. It seems the missing – sign also applies to floating buoys. Don’t know when they were introduced. The missing -sign applies to mainly to minimum temperatures in higher latitudes and in winter. It should not affect Australia much but has a big affect in the Arctic, Antarctic, Siberia. Northern Canada etc. I think your work and Anthony’s sleuthing would make a good paper to force a complete review of all the databases and all papers which have relied on these databases without noting errors. I was just going to post about Anthony’s METAR post too. 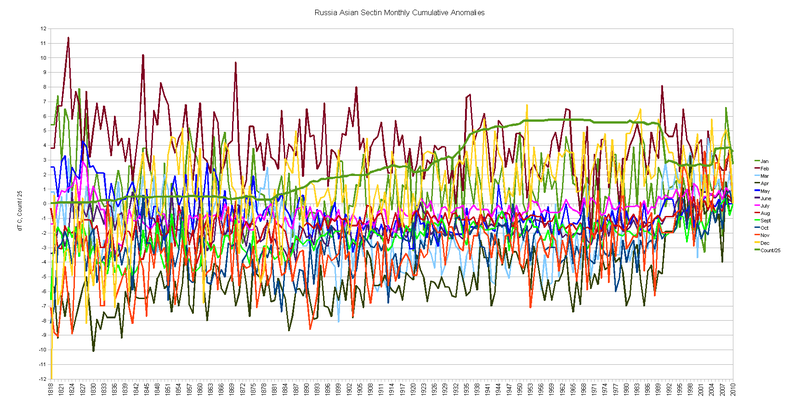 If METAR was introduced in Russia in 1989, it could be a possible explanation for the strange change in Russian spring and autumn temperatures (since temperatures will be both above an below zero in this period, errors are much more likely to slip by quality control than in the cold winter months).